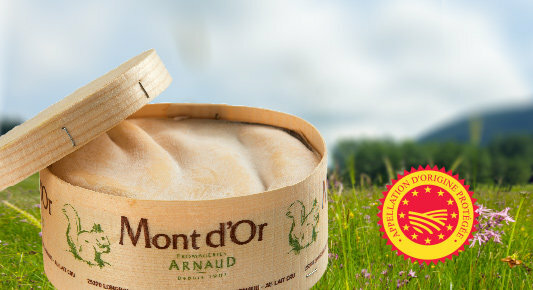 This week I’m talking about Vacherin Mont’Dor a soft washed rind cheese from Franche-Comte in France which is produced seasonally and is sold from around August to March. The reason for its seasonality is because when the cows come down the mountain for Winter as it is often the coldest region in France so they return to their sheds, but the quality of milk changes and is better for soft cheese instead of hard cheese inparticular Comte. It also helps the cheese makers themselves because they can make this cheese in their own kitchens if needed because of the harsh weather. This cheese has some very special treatment that simply is one of a kind for example there are Sangliers (Spruce bark cutters) who come to the Jura region to help strip the bark into strips called Sangles. These are then wrapped around the cheese to protect it from becoming a blob. Centuries ago cheesemakers would have need wood for fuel to produce some cheese but cheese would be bartered for wood. Wood is rare to be used in modern day cheesemaking but Vacherin remains true to its heritage and thus every year the trees are felled to make this cheese. The bark adds a unique flavour to the cheese reminiscent of a pine scent and is now seen to be a contributor to the flavour of Vacherin. The overall appearance is a dark brown outer rind with a whitish orange rind that with the undulations is supposedly meant to represent the mountain range. Its sweet, rich, slightly earthy and woody flavour is a delight to behold and quite simply is a cheese sensation. There aren’t many cheeses that provide you with an experience that is centuries old but if you want a piece of cheese history then accompany this with a Cotes du Jura wine for the ultimate Vacherin experience. If it is cold outside pop it in the oven to bake then serve with onion, gherkins, salamis etc for a winter comfort meal. Available now for just a few weeks you need to pop along to Waitrose or your local Cheesemonger to get hold of a Vacherin.